Sudanese Professionals Association continues with sit-in outside the Defence Ministry - SABC News - Breaking news, special reports, world, business, sport coverage of all South African current events. Africa's news leader. Sudanese Professionals Association called for people to continue with the sit in. 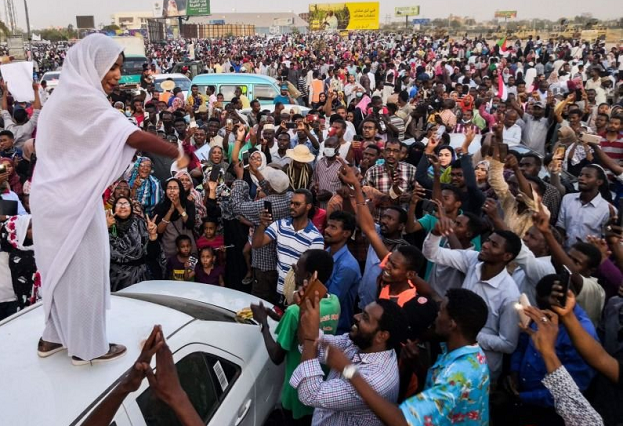 Earlier, the country’s main protest group, the Sudanese Professionals Association (SPA), called for people to continue with the sit in and foil any attempt to disperse them. The sit-in outside the compound, which also includes the intelligence headquarters and the presidential residence, began last week, after more than three months of protests triggered by a deepening economic crisis. While some protesters chanted and waved flags, others recorded signs of the protest movement, drawing women and doves on nearby walls. The protesters demanded that the country’s military rulers immediately hand power over to a civilian government. They also want ousted leader Omar al-Bashir brought to justice. At a meeting with political parties, the military council urged them to agree on an independent figure to be prime minister, said one protester, Abdelmeguid Afify. This entry was posted on 15 Apr 2019,02:40PM at 2:40 PM and is filed under Africa, Homepage Latest Stories Slider. You can follow any responses to this entry through the RSS 2.0 feed. Both comments and pings are currently closed.